Timber is a material designers love to use as its natural properties bring a warm, natural aesthetic to any project. Even with all its amazing properties, timber is not without its challenges. Being a natural material, timber can lose its colour when not properly maintained. Factors such as exposure to UV light and coating selection play a significant part in how the timber will age, and the level of maintenance required. 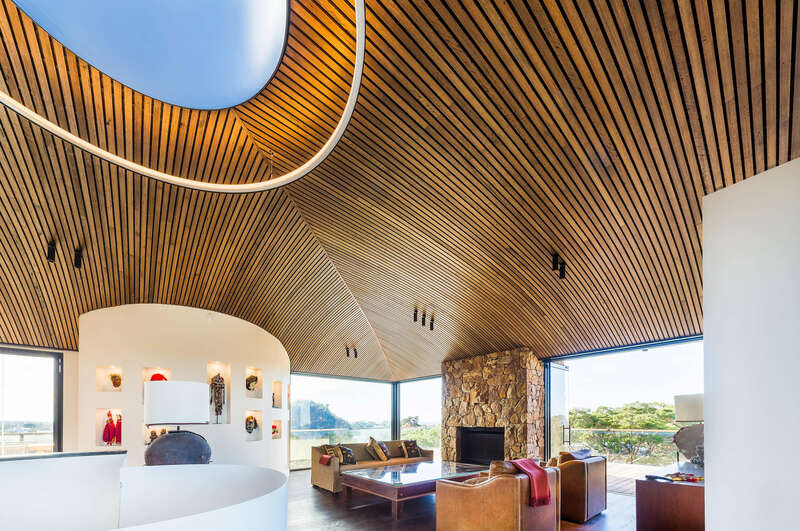 Protecting the timber from the elements, choosing the right coating and even considering materials which offer a similar aesthetic are a few ways designers can get the signature timber look, without the rigorous maintenance schedule that often comes with it. Outlined in this flowchart are the best methods offered when designing with timber externally to minimise that regular maintenance schedule clients often loathe. Here are some other techniques to help minimise the maintenance schedule of a project. 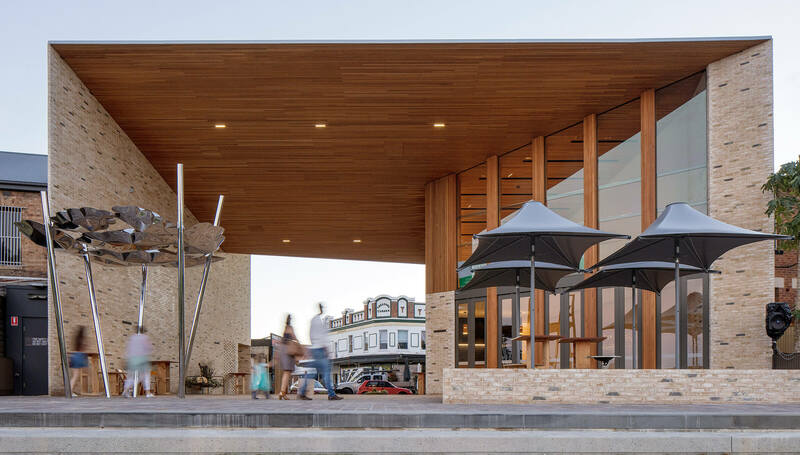 Timber can provide an aesthetic unlike any other building material, but it does require maintenance to sustain the desired look. By utilising timber in specific ways which minimise exposure to the elements, maintenance requirements can be substantially lessened. Timber used internally traditionally does not require maintenance as it is protected from exterior elements such as UV and rain. 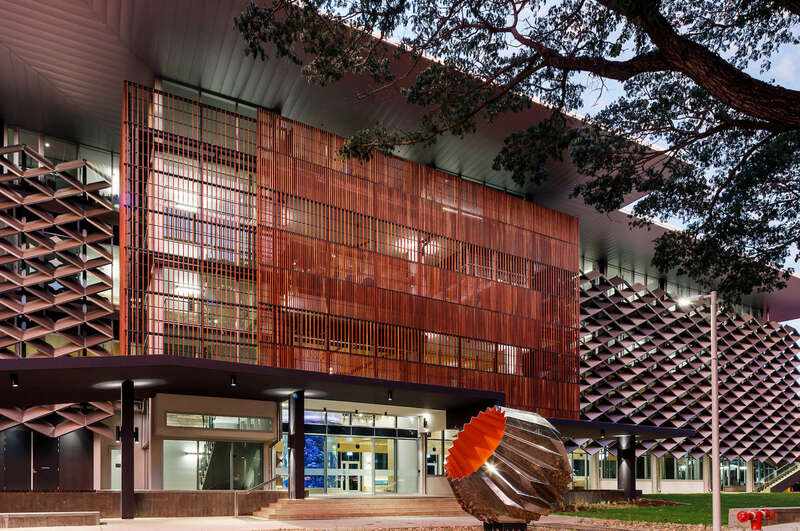 Exterior applications of timber require more finesse in balancing the aesthetics and protecting the timber due to the elements of an external environment. UV exposure is the most significant factor in timber losing its colour, caused by the degradation of surface cells. The simplest way to prevent this is to design in such a way that the timber itself experiences minimal UV exposure. 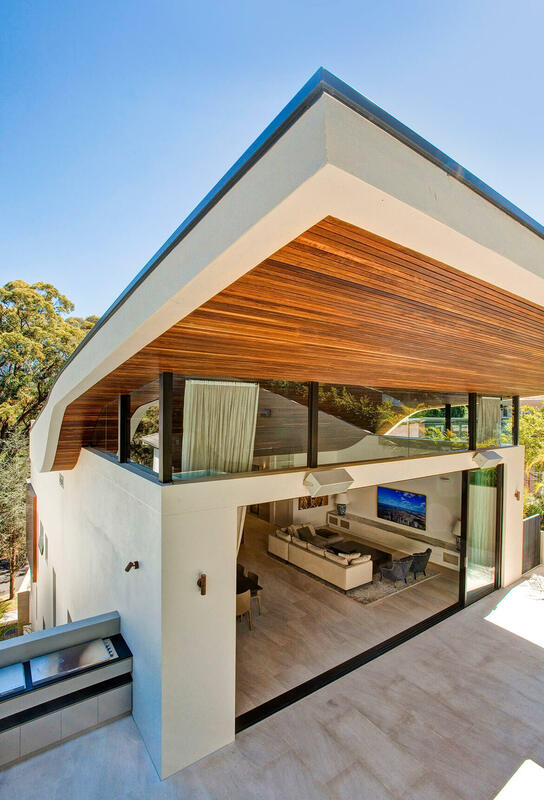 Areas such as eaves and soffits are ideal areas to use timber externally, without exposing it to UV. These areas allow timber to be used as an accent or highlight to an area, keeping both costs and maintenance to a minimum. 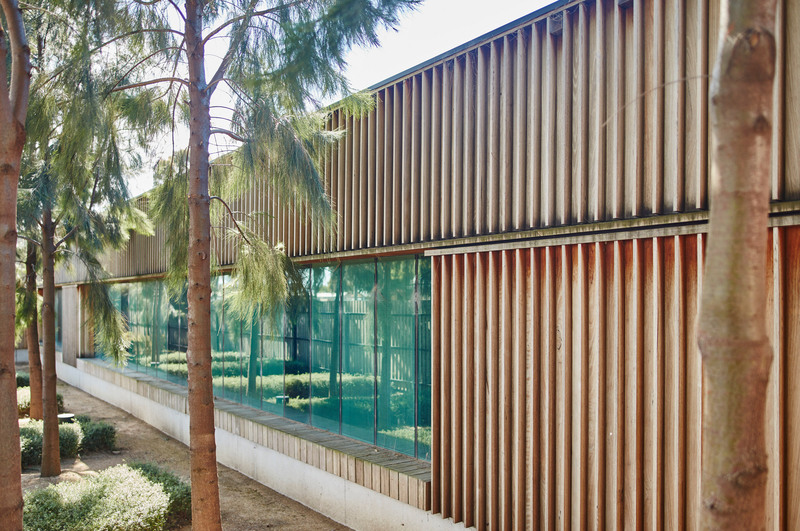 Using timber behind glass (pictured below) is another method used by architects which protect the timber while still taking advantage of the aesthetic. By using timber in these positions where they are protected, maintenance is reduced to virtually zero. 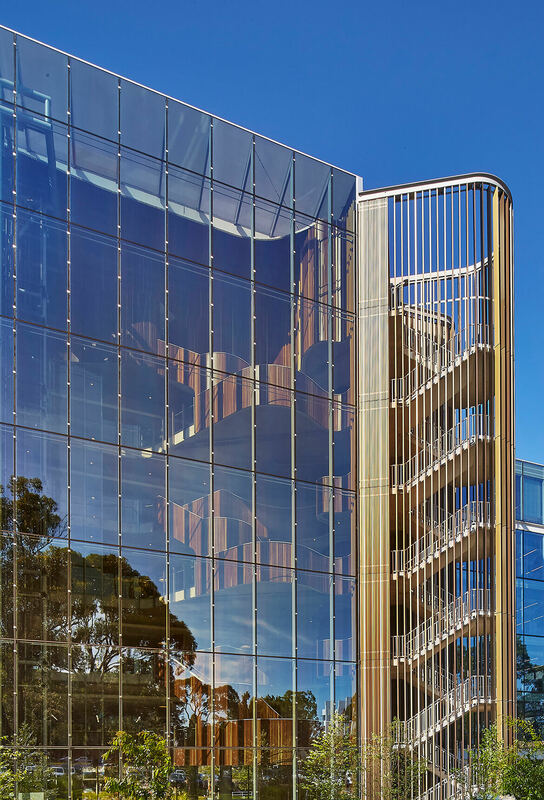 Timber used behind glass is substantially protected from UV radiation and requires very little maintenance while still providing a stunning timber aesthetic from the outside of the building. These Click-on battens are protected and require little maintenance. 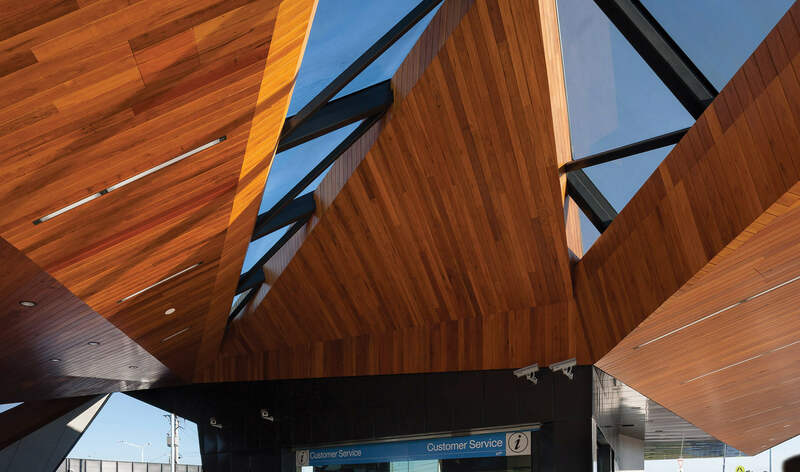 Soffits which run from internal areas to external provide a consistent feature throughout a project while protecting the timber from UV radiation. 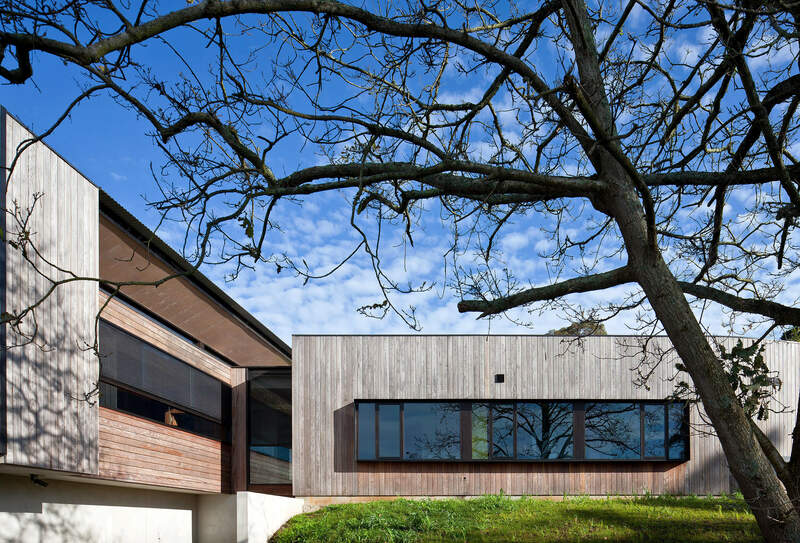 Instead of struggling to keep timber its natural colour when used externally, many architects are instead choosing to embrace the natural silvering process. Silvering occurs when surface cells of the timber are degraded from exposure to UV radiation and is typically prevented through the use of coatings which include a pigment to of help reflect UV rays. Clear oils are commonly applied to external timber applications where silvering off is the desired aesthetic. 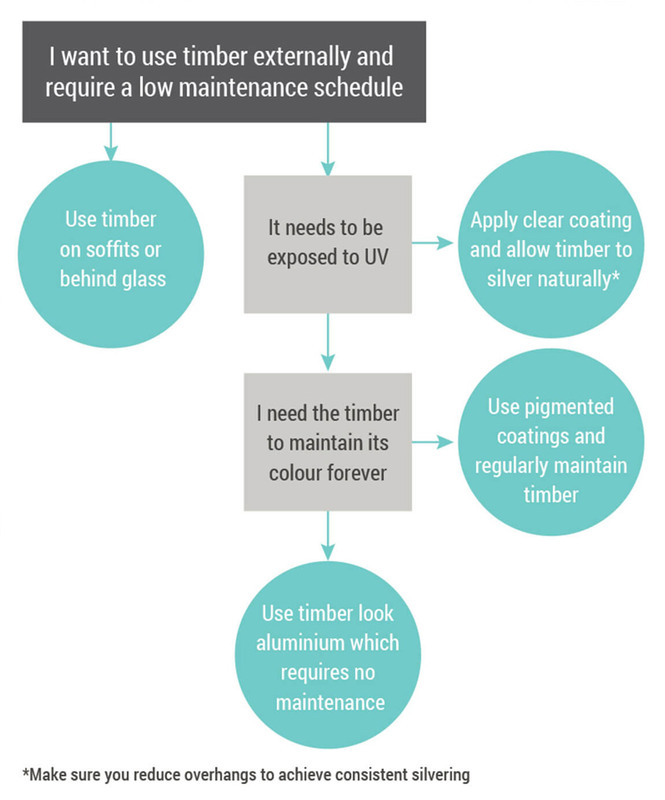 Timber which has been allowed to silver generally requires less maintenance, as clear coatings without pigment allow more UV radiation into the timber by design (see diagram below). For those who choose not to maintain their external timber, the integrity of the timber facade will not be compromised. Although Sculptform does not recommend this approach, the effects of not maintaining external timber will be purely aesthetic. When allowing timber to silver off, an important goal is to achieve consistent weathering. 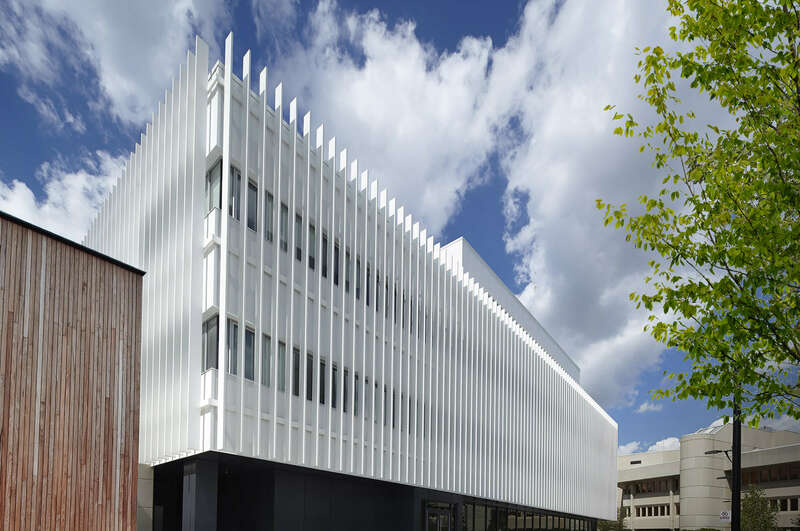 This allows the timber to silver evenly over the entire facade. 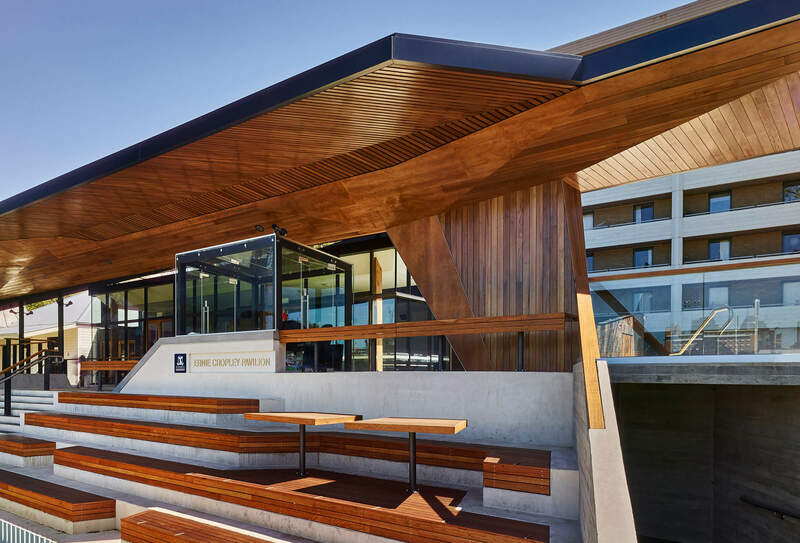 Read more about how to maintain consistent colour in external timber here. 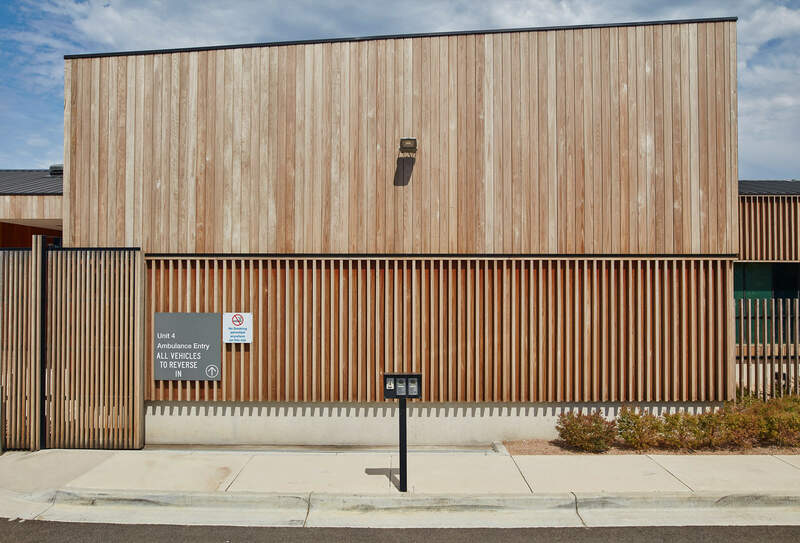 Making the right decisions in the design stage can allow timber to silver off consistently and create a spectacular natural weathered aesthetic. Choosing the right coating for an external timber application is vital to achieving the desired aesthetic and maintenance schedule. Coatings protect the timber from elements such as UV radiation through different methods, with varying degrees of success. Pigments can also be added to coatings to change the colour of timber or provide more UV protection. Penetrating oil coatings involve alkyd resins penetrating into the timber surface to hydrate the timber. These coatings degrade quickly when exposed to UV radiation and need regular re-coating. Colour tone or pigment can be added to slow the weathering process. These coatings create a film on the surface, filling the pores of the timber and protecting the surface cells of the timber from UV radiation. Because these coatings do not penetrate into the timber, they can be quite thick. Over time these coatings can peel, flake or blister. This newer coating technology uses alkyd-acrylic hybrid resins. These combine the best of both oil and film technologies, providing surface penetration, hydration and a thin surface film to help block UV radiation. If the design intent involves a timber look, but natural timber doesn’t meet compliance requirements such as required fire rating, timber look aluminium is an excellent replacement. 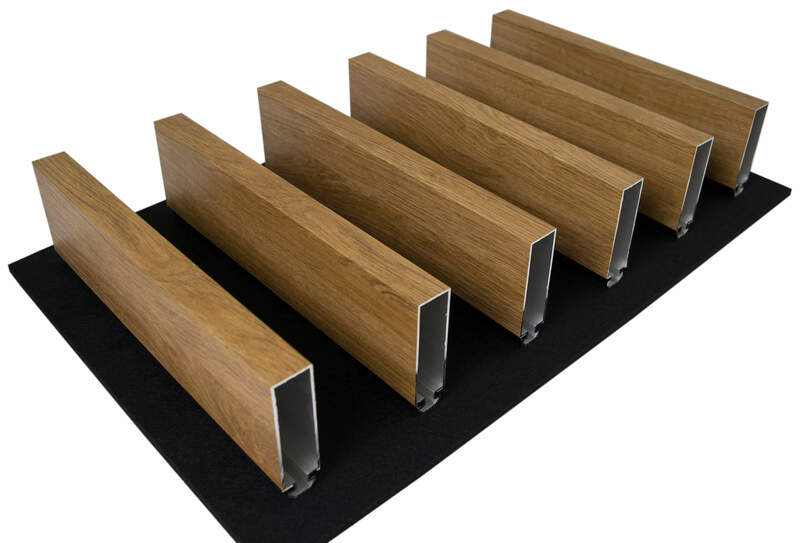 Sculptform’s timber look aluminium Click-on battens are designed to be used on exterior applications and require zero maintenance, while still providing an authentic timber aesthetic. These battens are lighter, stronger, and extremely durable when compared with traditional timber battens. With fire compliance being a particular area of interest recently, these wrapped aluminium battens achieve a Group One fire rating.